Danish Army Specific: Delivered with open and closed cab (44 kb) as part of the MDAP 1951/55. Historical: Design and development began in 1939. Diamond T´s model, based on a 4 ton chassis, became most successful and was adopted in 1940. Developed for issue to all arms and services of the US forces as a recovery unit for automotive vehicles and as a general mobile hoist. Like most US Army load capacities, the 4 ton rating was an underestimate of the vehicle's capability. This was intended to ensure that the designated load could be carried on rough ground. The strength of the vehicle's construction allowed it to carry twice this load on good roads but the US rating remained part of the vehicle's official description. The recovery vehicle was sometimes assessed as an equivalent to the British and Canadian light recovery vehicles. In practice it was in an intermediate class. It was capable of recovering trucks heavier than those a 3 ton gantry lorry might handle but not as heavy as the loads recovered by Scammell, the US Mack or Ward LaFrance. The Diamond T carried a heavy duty set of Holmes W45 Twin Boom Wrecker gear. This gear was designed in the inter-war period for civilian breakdown trucks, like the similar Gar Wood system. One boom could be used to lift a disabled vehicle out of a ditch on one side of the recovery vehicle while, if necessary, the boom on the other side could be swung out and anchored to a convenient solid object to act as a stabiliser. Either boom could operate as a normal crane but together the booms provided a greater lifting capacity at the rear of the vehicle for suspended tows. As with most of the military wreckers', the Diamond T was fitted with stabiliser legs on each side to keep the vehicle upright while the boom was being used for side lift. This also saved the necessity of using the opposite boom as an anchor and overstraining the structure and supporting cables. The Holmes gear booms were tubular with reinforcing trusses made from steel rods. The lifting winches were power operated and were rated at 5 US tons each (10,000 lbs.). Linked together, a lift of 10 US tons was possible, but to suspend a towed load of this weight would exceed the truck's chassis loading. The US Army system of recovery was to use the boom jibs for recovery tasks which with British equipment would be carried out using the chassis winch. 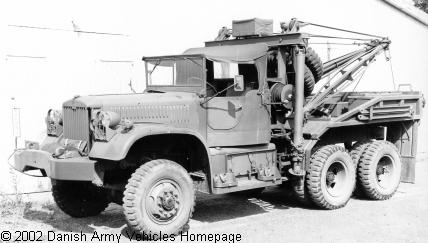 The Diamond T 4 tonner carried a front mounted Gar Wood winch rated at 15,000 lbs. (7½ US tons), i.e. less than the combined rating of the two jib winches. More than 6.000 wreckers produced as closed cab from 1940 until late 1942, and as open cab from late 1942 until 1945. Approx. 25 % of the vehicles were mounted with ring mount M32 (closed cab) or M36 (open cab) for anti-aircraft machine gun. Length: 7.42 m (289 inches). Height: 3.06 m (119 inches). Weight: 11.875 kg (26.118 lb.). Engine: Hercules RXC 6-cylinder, 8.668 cm3 (529 cubic inches) displacement, liquid cooled. Additional: 7.5 ton front winch capacity, Gar Wood type 3-U-615. Unlike the later M series wreckers, which used their air brake system as an air source for tyre inflation etc., the Diamond T 969 left the factory with a self-contained air compressor mounted between the booms.